It’s time to start discussing pitcher rankings and fantasy managers need to know it’s a new landscape for two reasons. First, the idea of every team having one or two 200-inning starters is *over*. The top arms are putting up similar stats to the past. The change now is with the floor. It has just fallen. Starters are just not going as long and the Wins and Strikeouts they accumulate are gone. Second, many bullpens are now going to more of a committee approach where there aren’t 30 set closers but more like 20. The lack of Saves in a concentrated few closers boost their value and the overall value of every Save. It’s time to get to the rankings. I used the 15-team Standings Gain Points (SGP) Formula from The Process to create these rankings. I used FanGraphs Depth Chart projections (stats in the table) along with three other sources (not to be named). I ranked them by the average SGP value and also included the standard deviation in all the values. The tier drops are quite significant. If I don’t get a top-4 pick, I’ll go with a starter every day. In two industry mock drafts in which I participated in, I was able to nab two of the top-5 and will gladly continue to make these picks. The near 250 K’s and great ratios at a high innings total are anchors that would allow me to stream arms from the glob. Here are the values for the top-135 pitchers (total drafted in a 15-team, nine-pitcher league). I’m just not going to pass on the top-11 (I’m a no on Kershaw) if they are available to me. I’m a little surprised to see Diaz as high as he is but owners must remember the floor has fallen that his 97 strikeouts and great rates push his value up. I’m not usually a big fan of picking a closer early but the cost of closers has really dropped this season after many owners got burnt last season over investing. Now, they are being too conservative. The first non-closing relievers come off the board at #76 with Josh Hader and #87 with Dellin Betances. The key for both is their 100+ projected strikeouts and handful of Wins and Saves. I’m a little surprised in the lack of variation between many of the pitchers. I really thought there would be more. Corey Kluber starts out divisive, but the 2.7 standard deviation is the highest until Craig Kimbell (4.2 S.D.) at #46 (some sources have him with no Saves) and Brad Peacock (3.0 S.D.) at #101 (undecided role). We hoped you liked reading Top-200 Fantasy Pitcher Rankings by Jeff Zimmerman! What does the 6.0 average represent for Julio Urias, or to say differently, what is the meaning of that number? Standing Gain Points which I stated I was using is how much an owner would move up in the standings if Urias’s stats were inserted into the standard 15-team league. In his case, 6 spots. In Sale’s case, 28 spots. 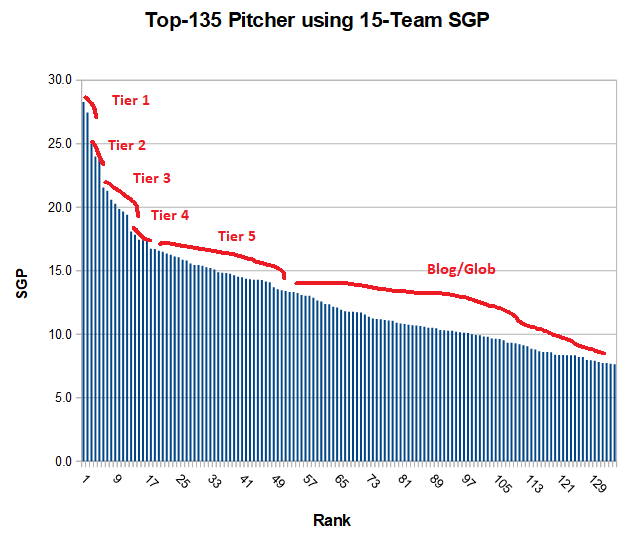 The standard 15 team league would have 135 active pitchers. How does a pitcher ranked 200th – i.e. below replacement level – move a team up 6 spots? About 20 K’s will move a pitcher up one spot in the standings, so 80 moves him up four spots. It’s about 2 Wins for one spot in the rankings. And if your ratios are horrible, e.g. Alex Cobb? I’m not sure how Alex Cobb improves your pitching staff in a 15 team league. He’s negative value. 9 wins and 124 K is ~10.5 points. Which means his horrible projected ratios will move you down ~4.4 points. Volume stats make him better than an empty spot. That’s misleading. You don’t have an “empty slot”, at worst you have replacement value. It’s more of a relative number than an absolute number. There’s also a diminishing return on counting stats. Once counting stats are decided, pitchers with crappy ratios have negative value and even aces can be worth benching. If you don’t understand the concept of SGP even with a link to it in the post, fair enough. Complaining that the rankings are bad because you don’t understand, that’s not so good. It’s basically just aesthetics, anyway. You’ve fixated on a below replacement player still adding 6 points. So if you change it from player A vs nothing to player A vs replacement value, you might get -2 instead of +6. But the list will still be in the same order, replacement level Samardzija will still project 1.6 points better than below-replacement Cobb. I’m not questioning the rankings/order; you can get there a myriad of ways. But the value being used does not indicate the purpose of the value itself…. A replacement-valued player should be 0.0. Yes it’s just algebra but that’s the point.